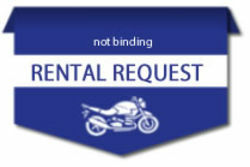 pick up of the rent bike the day before wed, 29.5.19 from 03:00 p.m. without extra payment! 4 days rental - only a weekend tariff ! pick up of the rent bike the day before wed, 19th June 19 from 03:00 p.m. without extra payment! our motorbike rental pool has over 100 actual and full equipped BMW motorbikes.